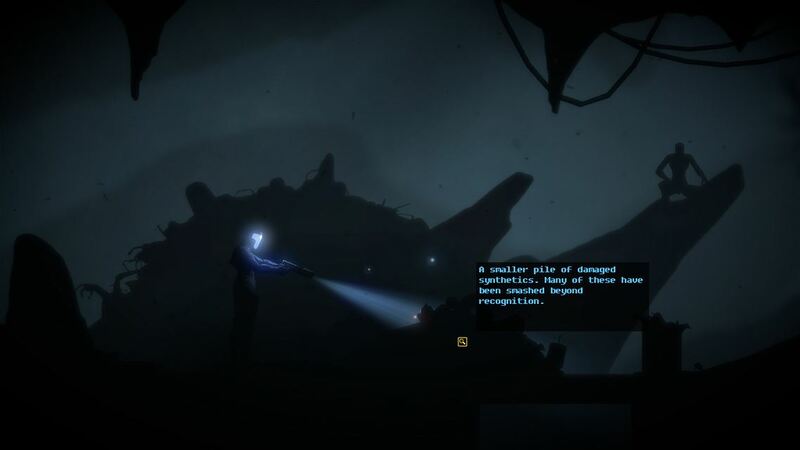 Did you play and love Playdead’s INSIDE and are hungry for another 2D platforming / puzzle solving adventure? Good news, then, because the Xbox One actually has a couple more for you. You could always play Another World (the game that basically started the genre 20+ years ago) or you could give a more modern take on the genre a try with The Fall. The Fall is a sci-fi story of an A.I. inside a sophisticated space suit that is acting on its own to keep its unconscious pilot alive after it crash landed into a mysterious facility. Finding medical care for the pilot is the objective, but to do so the A.I. has the break the rules of its core programming to do so. It is a truly fascinating experience that is absolutely worth a look. The Fall was originally released on Xbox One in July 2015 to mostly resounding silence. I didn’t even know it existed until it was suddenly on sale for $1.50 in late July 2016. I bought it. I played it. I loved it. And I feel absolutely ashamed I didn’t play it earlier so I could have been singing its praises for the last year to get more people to try it. If I would have known it was this good, I would have happily paid the full $10 MSRP, which I hope you will do after reading this review. It must be noted that The Fall is the first in a planned trilogy of games, so it ends on a cliffhanger right when things are getting interesting. The next entry is planned for release in Q1 2017. We can’t wait! The main character of The Fall is an A.I. inside of a sophisticated space suit named A.R.I.D.. After crash landing on an alien world – they literally fall out of space and smash into the planet – the suit’s pilot is badly injured and unconscious, so A.R.I.D. takes over control of the suit in order to find medical attention. They crashed into a mysterious facility full of destroyed robots and soon discover a friendly A.I. running the facility that tries to help them, along with an enemy robot trying to stop them. There are also human corpses scattered around as well. Something odd has happened at this facility. Key functions of the space suit, such as a network interface and ability to use weapons, among other things, were deactivated upon the crash and A.R.I.D. can’t activate them unless the pilot’s life is in grave danger and requires the functions. In order to make that happen, A.R.I.D. has to defy her own programming to intentionally put the pilot’s life in danger in order to save him. This becomes the real focus of the story in The Fall as it presents a number of interesting questions about artificial intelligence, adaptation, and self-preservation. The story is classic sci-fi from the very foundations of the genre, and it is awesome. It also ends with a fantastic twist that will give you goosebumps! 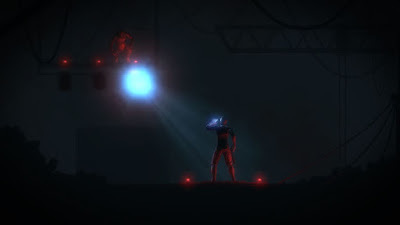 The gameplay in The Fall is a blend of 2D adventure platformers like Another World, Limbo, and INSIDE mixed with item-based puzzle solving from the old Sierra adventure games. You have a flashlight that lets you scan objects and a little pop up menu that lets you interact with them or use items. Moment to moment gameplay consists mostly of scanning every inch of an area, picking up everything you find, and then figuring out how to use the items to solve puzzles. Most of the puzzles don’t really have very obvious solutions, which is why scanning everything and picking everything up is so important. I have to admit that I quit in frustration more than a few times and just looked up solutions to some puzzles and, more often than not, the solution involved an item I didn’t find because I didn’t scan something to activate that step of the puzzle. My advice is to be very thorough and meticulous, and try every option available, and you can solve most things. There are also some combat sections here and there where enemy robots will show up that you have to dispatch in order to proceed. The combat is usually really simple where you just hide behind cover and then pop out and shoot when you have an opening. These sections are easy and kind of boring, to be honest. I suppose they are necessary for the story, though, which is better than just shoe horning combat into a game that didn’t need it like so many games do. All in all, the game plays fairly well, but the controls can be pretty fiddly. Lining up your scanner just right so you can activate stuff can be a pain. Thankfully, the game never relies on split second reflexes or rapid decisions, so the slight clunkiness isn’t really a problem. It could definitely be better, though. The presentation in The Fall is outstanding despite being very simple. The menus and interface are like oldschool DOS, which gives it that retro sci-fi feel. 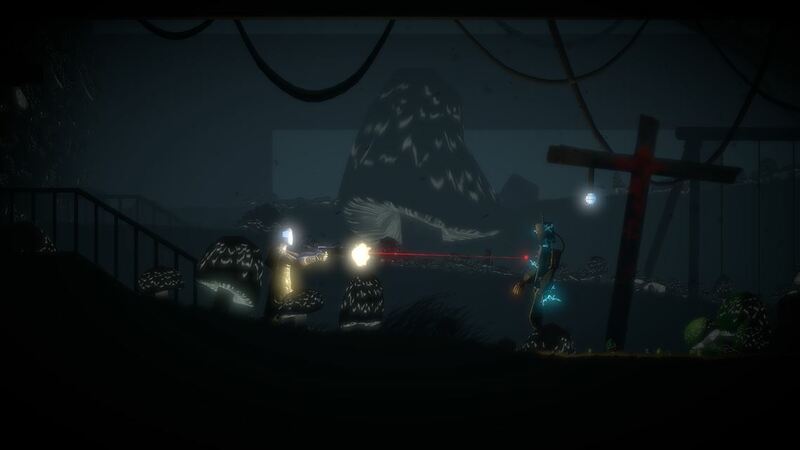 The game is very dark, so the brief flashes of color and light you do get really pop and look great. It has a very unique style that works perfectly. 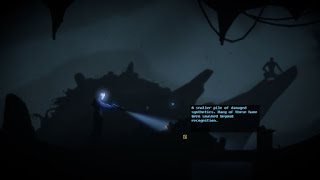 The sound is also fantastically well done with great voice acting and excellent ambient sound design that creates a creepy atmosphere without standing out too much. When it is all said and done, The Fall is an incredible experience that I highly recommend to any sci-fi and 2D adventure fans. The story is simply outstanding and the gameplay is solid enough with some fantastic puzzles. It only takes 3-hours or so to beat the first time, but there are a lot of clever achievements that ask you to do things slightly differently that make it fun to replay at least once more. I feel the $10 price is just right, too. The Fall is awesome and I highly recommend you buy it.